Athing Mu is halfway to her goal of four titles in the same meet, a competitive 100m race is shaping up in the men's 17-18-year-old division and Jonathan Simms took down one of Brandon Miller's 800m age group records. 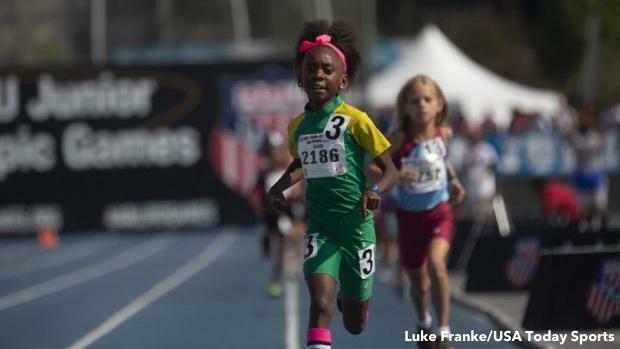 It was an eventful fifth day at the 2018 AAU Junior Olympic Games, free of weather delays and heavy on 800m finals and 100m and hurdle prelims. Mu's 2:07.54 was enough to win by six seconds and keeps her in the running for the 200-400-800-1500 quadruple. Elijha Johnson, Tyrese Cooper and Charles Lewis all ran within .04 seconds of each other in separate heats of the 100m semifinals. The 11-year-old Simms ran 2:11.58 in the 800m to take .40 seconds off of Miller's mark, but Miller would have his own opportunity to take center stage Wednesday. Here are some of the highlights of the fifth day of competition in Des Moines. Cha'iel Johnson defended her 800m title, running 2:13.81 to improve upon her second-place finish in the 1500m. The 800m was competitive for the first 700 meters, but Johnson pulled away in the home stretch. Brandon Miller won by a huge margin in the 15-16 Boys 800m, dropping a 1:50.14 to take victory by over seconds. It's Miller's title of the meet. And the second time he's busted out a cool uniform. If Kevin Durant doesn't want the Slim Reaper nickname, then I think we've found a worthy candidate. The ribbon is on point.